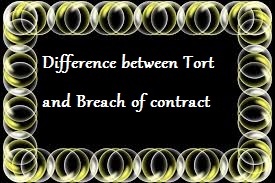 A tort is a civil wrong which is not exclusively the breach of contract. A contract is an agreement enforceable by law. Contractual liability, therefore, arises out of agreement between the parties Tortious liability, on the other hand, arises out of a breach of duty which is not a breach of contract.